How I got this book: got it from my parents as a Christmas present, yay! Why I read this book: I LOVED The Hundred Thousand Kingdoms, which is the first book in this series. Besides, look at the pretty cover! Goodreads summary: "The gods have broken free after centuries of slavery, and the world holds its breath, fearing their vengeance. 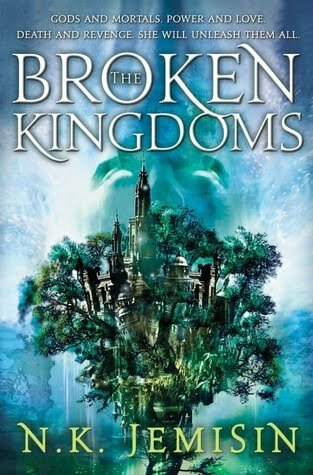 The saga of mortals and immortals continues in THE BROKEN KINGDOMS. In the city of Shadow, beneath the World Tree, alleyways shimmer with magic and godlings live hidden among mortalkind. Oree Shoth, a blind artist, takes in a homeless man who glows like a living sun to her strange sight. This act of kindness engulfs Oree in a nightmarish conspiracy. Someone, somehow, is murdering godlings, leaving their desecrated bodies all over the city. Oree's peculiar guest is at the heart of it, his presence putting her in mortal danger -- but is it him the killers want, or Oree? And is the earthly power of the Arameri king their ultimate goal, or have they set their sights on the gods themselves?" I first fell in love with this series when I saw the cover of the Hundred Thousand Kingdoms, it's absolutely beautiful and I so hoped the writing was as good as the cover promised. And it was! I devoured that one and then had to wait 6 agonizing months for the sequel to come out. And was rewarded for my patience with both another pretty cover and an amazing story. Set 10 years after the happenings in The Hundred Thousand Kingdoms, we see the story through Oree's eyes, or more acurately: through her eyes, ears, smell and touch. Oree is blind, with the strange ability to see magic. This means she can see the godlings (children of the gods) and any other magic, which leaves a kind of residu sometimes. And as Shadow is a city godlings frequent, she still gets to see a huge amount of the place she lives in. It was so interesting to experience the world through someone who can't see and who doesn't take it for granted the times she can. I also thought it was a nice touch Oree's eyes make people uncomfortable, as in they're repelled by them. It's a change from the different but beautiful eyes. And being able to see magic is just really cool. Oree interacts with the godlings frequently and one, Madding, used to be her lover. Their interaction is heartbreaking, they didn't break it off because they stopped loving each other, but because he is immortal and fears the pain of loosing her when she dies. Recently there has been an addition to her house: a strange man who glows magic every morning, who she found in the trash one day. He doesn't talk and since Oree wants to address him somehow, she names him Shiny. The godlings don't like Shiny, but none will tell Oree why. Slowly she figures it out and though I remembered what happened in the first book, I was still slow to grasp the concept. If information about who this man really is gets out, the whole world as Oree knows it would stand on his head. There's also the problem of people murdering godlings, who aren't supposed to be able to die at the hands of mortals. So who's behind this? And what does he want? Oree's thrown right into the middle of it all and doesn't know how she'll make it out of this alive. This book was so incredibly amazing! Oree is such a real character, her reactions to things are relateable, though I wouldn't necessarily make the same choices she did, I completely supported her througout the book. She's a strong woman and doesn't like to rely on other people for things. She's learned to cope with being blind and I really enjoyed her story. I think I developed a little crush on Madding, he is a beautiful person and cares about Oree very much. Godlings have a complex nature and I though Madding and the other were very interesting. Shiny (OMG, how much do I love the author/Oree for coming up with this one! Too funny!) is mysterious and at first, I did not like him very much, but he shows real growth and he has earned a special spot in my heart all for himself. We'd already met him in the first book and I loved how Jemisin explored his character in this one. The storytelling is beautiful, I could picture everything the author mentions and I loved how I just wanted to keep on reading and at the same time not wanting the book to end. Jemisin has created a wonderful world with perhaps a more mythical than fantasy feeling to it and I absolutely loved it. Now I'll have to wait another agonizing 6 months for the next one! Wow! You've convinced me: I've simply got to read both books! Thanks for the terrific rec that offers enough detail and enthusiasm to get me moving toward the library right away. Wow, this definitely sounds intriguing ... I'll be keeping my eye out for it. The first book was a page-turner. I might have to check the sequel out! I'm definately going to have to pick this series up this summer!